Home » Blog » Black Pudding Best For Anaemia. Black Pudding Best For Anaemia. 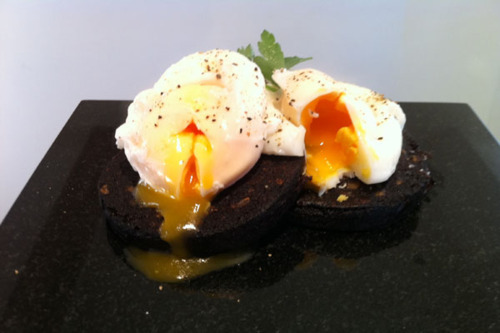 Black Pudding slices with Egg: an excellent source of iron. As reported in the Daily Express early in 2012 black pudding is an excellent source of “heam” which is the type of iron that is absorbed more easily by the body. Women are particularly prone to iron deficiency and to gain a whopping 90% of it from just one meal try two scambled/poached eggs, two slices of black pudding and a glass of orange juice for a quick and easy breakfast or lunch. This is an excellent meal to boost your iron intake, as well as the black pudding the eggs also contain iron and the Victamin C in the orange juice improves the absorption of the iron. Hello there. I discovered your web site by the use of Google at the same time as looking for a similar subject, your site got here up. It seems good. I’ve bookmarked it in my google bookmarks to come back later. Please advise where you stock your black pudding in East Sussex (namely Eastbourne, or nearby). Many thanks.